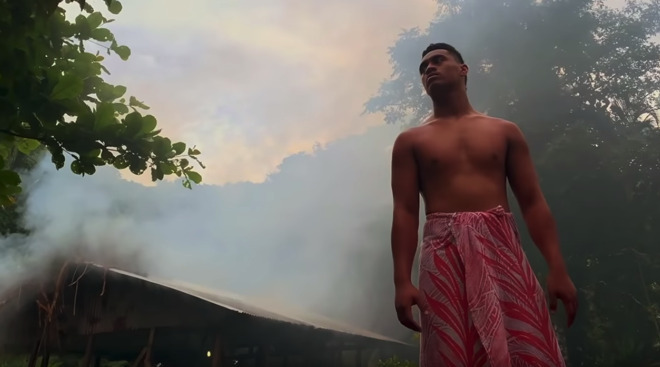 The three-minute video, titled "The Lonely Palm Tree, Samoa," highlights 17-year-old Eddie Siaumau, a football-focused athlete who is shown training for the sport and aspects of his life on the island. The name of the film stems from a palm tree located on a small island, one that has withstood hurricanes and other weather events, and is seen as a symbol of strength to Siaumau. American Samoa, which has the nickname of "Football Island," is reported in the film to have a proportionately high number of athletes entering the NFL, with athletes approximately 56 times more likely to join a team and to play in the league than Americans from other areas. Commissioned by Apple, the video was directed by Steven Counts with Eric Kuzma as director of photography, Heather Zara as executive producer, and Harrison Smith credited as an assistant. While the video uses an iPhone XS as a camera, more equipment was used to capture the high quality visuals on display. Apple lists the use of the DJI Osmo Mobile 2, Joby GripTight Pro Video GP Stand, NiSi Smartphones Filter Kit, and the Filmic Pro app to get the shots. "Shot on iPhone" is used by Apple to promote the high quality cameras it uses in the iPhone, highlighting photographs taken by members of the public and professionals alongside video. Other short films in the series include a documentary on Japan's "decotora" scene and a series of films about the essence of soccer. I'll be going on family holiday soon and have organised a director, director of photography, executive producer, assistant and a bunch of expensive camera accessories so I too can take advantage of the iPhone's video capabilities. So no time spent in this ad talking about the high rate of brain damage caused by repeat concussions in NFL football players, eh? I'd think the NFL would need to talk about it more first. Or the fact that they continue to be given “non-profit” status. The NFL is simply another tax shelter for the Über wealthy. And, to add insult to injury, they are more than happy to get the taxpayer to pay for their stadiums. But I guess that lands at the feet of the politicians and the general public who grant them approval. Stupid people. Don’t even know when they’re being taken advantage of. I’m not a fan of the NFL, but this isn’t true. The only part of the NFL that ever was a nonprofit was the league office, which acted as a trade association (a 501(c)6 like other industry trade associations, as opposed to a charity which is a 501(c)3) and didn’t perform business activities. The moneymakers are the teams. And their league office gave up their nonprofit status in 2015.